Renee Capozzola is an international award-winning underwater photographer who specializes in wide angle and over-under images. Her work is an intriguing combination of artistic talent honed through oil painting during her youth and a professional background in biology. To that end, her images have won numerous prestigious accolades, including first place in the 2018 Asia Pacific UW Photo Challenge, first place in the 2017 Ocean Geographic Pictures of the Year, and the Best In Show award at 2017 Beneath The Sea. In 2017, Renee was selected for the International Photography Awards 2017 curated Best of Show Exhibition, which features a special selection of winning images from the 2017 International Photography Awards Competition and displays them in numerous venues around the world including New York City, Tokyo, Paris, and Moscow. She was a member of the USA National Team that won the 2016 World Shootout, and her work has also appeared throughout the world in leading print and online dive publications. 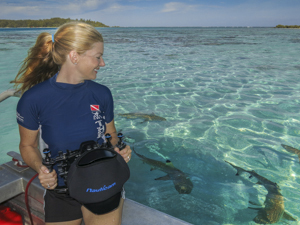 When she is not in the water with her camera, Renee teaches biology and educates her students about the challenges facing our oceans and the importance of conserving marine ecosystems.